Undersized fish and anglers have one thing in common – neither want to be attached to a hook. It is not an inexhaustible resource out there and as anglers we have a responsibility to take care of our fish stocks as well as treat fish with respect. Fishers will sometimes catch and release numerous juvenile sized fish – pickers – before capturing their target, legal sized specimens. The problem is that the catching and releasing process can harm or kill juvenile fish, meaning they will not have a chance to breed and build the population. Two good ways to avoid catching undersized fish are; using suitable lures (like soft-baits or slow jigs for example) and using big baits with big hooks. A third option is hook style. Modern lures such as soft-baits and slow jigs catch fish of legal size more often, and they are far less likely to gut hook fish. If you are a bait fisher, using large hooks with large baits is another effective way of avoiding the capture of undersized fish. Circle hooks are a good first choice of hook type as they lip hook fish more often. Large J style hooks such as size 7/0 or larger, will gut hook undersized fish less often than smaller hooks. Target appendage hooks, which incorporate a small length of wire in their design, have been proven to discourage small fish from hooking up. Essentially, the wire, which sticks out at about 45 degrees from the eye of the hook, gives the smaller fish a discouraging prick. Bigger fish will just swallow the bait whole. Designed by Paul Barnes, who has been a leading developer of kite fishing and beach longlining techniques, not to mention a strong recreational fishing advocate, did a large amount of testing and research to come up with a hook that went a long way to prevent juvenile mortality. If you are bait fishing with large hooks and losing lots of bait to the small ones, changing to smaller hooks to catch the bait thieves is not the answer. Patience can pay off with larger hooks, as losing bait and feeding the fish can draw the larger specimens to your area where they eventually get caught. A more productive option is to simply move to a different location and see if you can find the sort of habitat that holds larger fish. 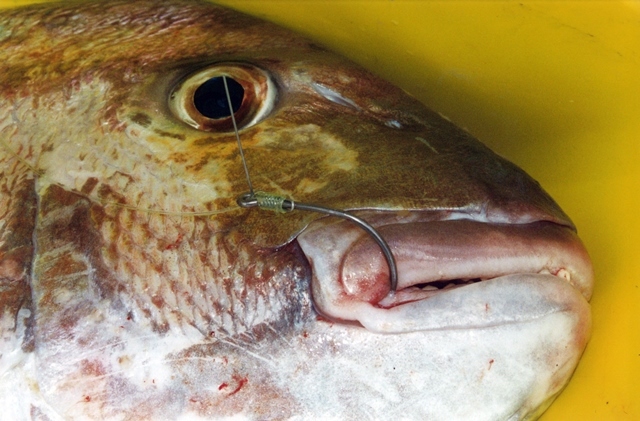 These techniques are important because gut hooked fish have a very low chance of survival when released. The recommendation is to do what you can to avoid catching the small ones in the first place. Avoiding any handling of fish increases their chances of survival in the wild and means they are more likely to contribute to a healthy and fully functioning ecosystem. It is all about being smart to selectively target the legal sized fish. Think about how you fish – can you adopt some of these techniques to help our fishery? The New Zealand Sport Fishing Council, through its public advocacy arm LegaSea, has developed the FishCare programme which covers all manner of issues important to recreational fishers around fish stocks and the marine environment. Previous Post:Become an LBG addict!